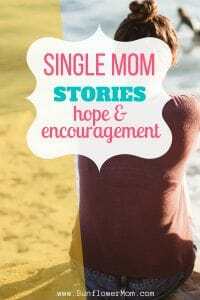 Single mom stories from other women are designed to give you hope and encouragement. Join this series as we hear from other single moms (current or former) who conquered the overwhelm. Some of us become single mothers by choice, some are forced into it, and some simply face the fact that we must finally become a single mom. We’ve all been there. The road can be quite long. And the road is different for everyone. Sometimes it helps to listen to stories of others who went ahead of us. Although no one’s story will mirror your own exactly, our hope is that you’ll hope and encouragement in these single mom stories. These moms have made it through the difficult seasons and you will too. Pin this page as this list will be updated frequently. If you or someone you know would like to be featured, please fill out this form for consideration.